Physicist Lily Asquith recently wrote an interesting and accessible piece on quarks, which was featured on Jon Butterworth’s excellent Life and Physics blog. Included within the post was an interesting depiction of physicist Murray Gell-Mann, as provided by illustrator and artist Toya Walker. Toya also happens to be the individual behind the imaginative and colourful imagery associated with the LHCsound project – many of which are used to help explain some of the complex concepts behind the process of sonification and particle physics. When attempting to communicate complicated ideas and concepts we often turn to visual aids to help translate information into an easily digestible format. We perceive the world from a predominantly visual perspective, meaning that illustrations and diagrams are an often more effective mode of communication, especially when dealing with higher levels of complexity. For example, an annotated diagram of the heart is often much easier to understand than a detailed description of it’s anatomy. However such ‘diagrams’ can be uninspiring and do little to engage with those not already interested or familiar with the subject concerned. 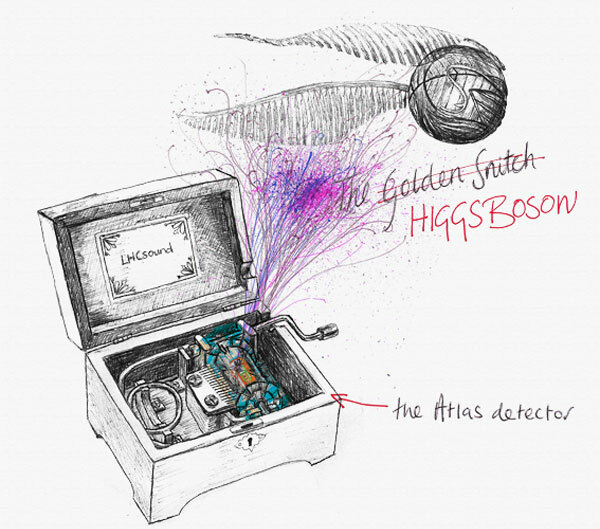 The use of visual metaphor and analogy can thus be very helpful in reaching out to a wider audience; for example one of Toya’s images depicts the Higgs Boson as the ‘Golden Snitch’ (as found in Harry Potter) in a humorous and accessible reference to the elusive nature of the particle. As such visual imagery is tasked with the responsibility of translating specialist information into a language that is easily comprehendible but also appealing to non-specialist audiences. This is what I appreciate in Toya’s work. Even in a project that is primarily concerned with conveying information through sound, there is still significant emphasis dedicated to the use of visual imagery to explain key concepts. As a result, the project opens up the Large Hadron Collider (and the excitement associated with it), to those who may have once been alienated by it’s complexities (like me!). Simko is an American born electronic producer and DJ, who produces an interesting and subtle blend of techno; her classical piano training is certainly evident in the wonderfully rich and melodic textures of her work. The film itself details three years at the American Fermilab, examining the concerns arising from the fact that it is often politicians, not scientists, who decide upon the future and value of science within society. In the first episode I explore the work scientists have been doing to turn the data from the Large Hadron Collider at Cern into sound. Through a process known as ‘sonification’ – data from the ATLAS experiment at CERN can be transformed into sound, providing an insight into what the elusive Higgs Boson may sound like. Or listen to this feature within episode 074 of Short Science.